Backup database in Access is a necessary task for Microsoft Access users. Handy Backup provides a tool to backup an Access database automatically. It is necessary to save Access databases regularly to avoid data loss. Handy Backup can provide an auto backup for a database on MS Access 2013, 2010 or any other edition. 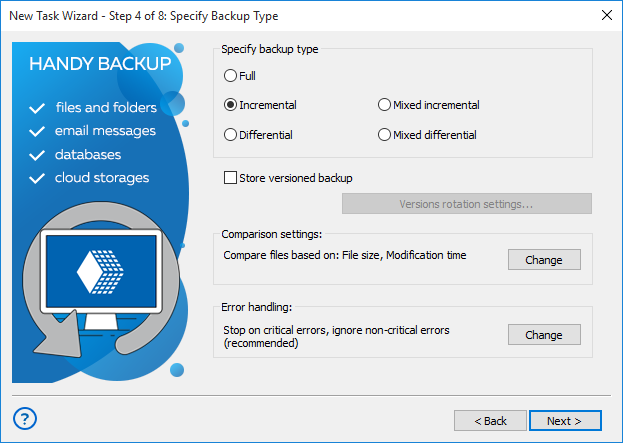 Handy Backup provides a set of features for backing up Microsoft Access databases and tables, both specialized and generic, allowing creating just any backup strategy the user want to apply. Handy Backup allows you backing up the database without stopping it. There is no need to close the program (so there are no disconnections). Handy Backup allows not to stop the workflow for a backup. You do not even need to remember how you backup a database in Access: automatic backup MS Access database is always available. As long as you will not choose compression or encryption options, Handy Backup saves copies of all your data, including MS Access databases, in original formats. This can be useful for browsing or changing databases just in backups, without a restoration, for manual copying or cloning data. 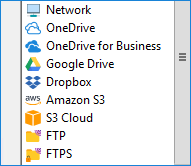 The program supports different options for saving MS Access files, including Computer, Network, FTP, FTPS and online backup service HBDrive. To reach a peak of safety and convenience, we recommend backing up your database both locally and online whenever possible. The FTPS is helpful when security is important (it’s FTP with TLS/SSL protocols). In addition to the full backup, the incremental, differential and mixed backup options are also available. These types of backups are saving only changes between new and backup files. Therefore, these techniques processes much less data, saving a storage space and a backup time. A data compression can be useful to reduce the size of the backup. 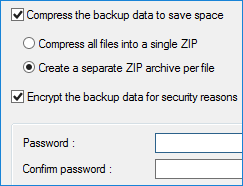 If you need better protection for your backup files because of security reasons, choose “Encrypt the backup” option, to apply a strong modified BlowFish algorithm with a 128-bit architecture to your data. You can back up Access database in a fully automated mode, selecting an interval for repeated backups (every day, on some weekdays, on month days or any other period from months to minutes). The majority of users do daily or weekly automatic backups. If you are an active database user, you can set up your own options to repeat the backup procedure. The Professional edition has a generic Database option capable to back up MS Access databases via an appropriate ODBC driver pre-installed on your system. Start Handy Backup. Create a new task by clicking a button (or through a menu). Select a backup task on the Step 1. On the next step, select the “Database” data source option and add it to a backup list. Caveat: If you do not see a Database plug-in at the list, please refer to plug-in help section to solve your problem. If your MS Access instance has an ODBC driver, you will see the “MS Access database” option. Note: An ODBC driver for your database is not a part of Handy Backup! Please select and install it manually, and do not forget to add this driver to the list of data sources in Windows. On the drop-down list, select a database you need to save as a copy. 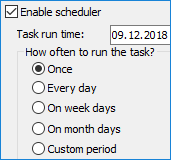 After you complete the data selection, click OK and proceed to create other task parameters as described in the User Manual. You can select a data storage, choose the backup method, compress and encrypt your information, schedule and control a task, and give it a name. To restore your Microsoft Access database from backup, create a new restoration task and select a file with an .hbi extension in your backup folder. Handy Backup will automatically prompt you proper MS Access database to restore. Then choose the destination for restoring your data. Continue creating a restoration task, as described in the User Manual. 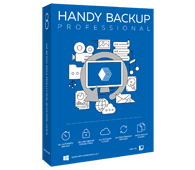 Try using a full edition of Handy Backup for a free 30-days trial period, to get a personal experience about how to backup MS Access databases when using this software solution. Our program will greatly improve the quality of your life.